Thomas Ligotti is, by now, well known amongst aficionados of horrific fiction and the weird as a writer who has taken the influence of the likes of H.P. Lovecraft and Edgar Allen Poe and created an (all too small) body of work which often surpasses his illustrious forbears. My Work Is Not Yet Done, subtitled Three Tales of Corporate Horror, takes the gripes of working stiffs everywhere and twists them into something of twisted beauty. While it may be true that a modern corporations offices with their fluorescent lighting, computers and sharp edges aren’t an obvious setting for Ligotti’s brand of weird fiction, I think that he successfully realises his bleak vision which, while it may not rank amongst the very best of Ligotti’s work, is certainly a fine piece of writing and one which may also be a good introduction for those previously unfamiliar with him. There are three tales in this slim volume; the longest of them being My Work Is Not Yet Done. In this, Frank Dominio (who is repeatedly called Domino by his boss and co-workers in a somewhat tiresome, but certainly effective, attempt to belittle him) relates his story. A middling member of middle management, Dominio has risen as far as he wishes within the company for which he works. We don’t learn what it is that the company does (not that this matters) we don’t even have any particular sense of Dominio’s tasks within the company (again, largely irrelevant). The most we see of Dominio’s working life is the meetings that he has with his co-workers whom he labels variously ‘The Seven Dwarves’, ‘The Seven’ or, ‘The Seven Swine’. The idea of corporate horror works on a couple of levels. Firstly, there is the horror that those of us who work, or have worked, in such an environment feel at what often has to be done to succeed, or even survive. The second is more in keeping with Ligotti’s oeuvre. His fiction seeks out the world beyond and behind our own; it wallows in decay, death and despair. “Of course there is a measure of the beast’s blood in anyone who aspires to maintain a place in the world, anyone who lacks that ultimate decency to remove themselves from the herd either by violence to themselves or total capitulation to their dread. It’s simply a matter of degree. Dominio’s horror at the system in which he serves and the behaviour that it forces from him and his co-workers is the staple of many an after work rant. Indeed, the politicking and conspiracy against him, no matter how unpleasant, are firmly rooted in the everyday. Once ousted from the company through a number of subtle actions designed to reduce his power and standing within the company, forcing him into an ignominious exit; a forced resignation. His actions following this are within the realms of possibility, if extreme. Hurt by the ouster, a lot of this stemming from his belief that his being sidelined illustrates the failure of his colleagues to recognise his competence, he purchases guns, a knife and paper to write his manifesto. So ends part one. As we enter the second part, however, events don’t follow the logic of a spurned worker tooling up. Though the tone of the writing is entirely in keeping with the first part, Dominio finds that he is not beholden to the normal constraints of physical reality. He finds that he is able to see things from afar and alter the physical world in ways that he could barely have imagined before. This transcending of the physical realm allows him to extract a blood price far more satisfying to him than the relative mundanity of a worker’s gun-assisted office blood-bath. From the point of view of Ligotti’s writing, this allows him to illustrate the horrors that lurk everywhere in the world, just beyond our ken; the evil and chaos that lurks behind the thin veneer of order and civilisation. Dominio even extends his anger at his swinish cohorts to describe it as being ‘The Great Black Swine’. The other two stories, I Have A Special Plan For This World and The Nightmare Network, continue with this theme, though not quite so effectively as the longer of the three stories. For me, much of the pleasure of Ligotti’s writing is not simply the horror at the very existence of the world (though that does give a definite, if perverse, pleasure), but his style. Some would probably find Ligotti overly verbose. He does have something of a tendency to craft rich and complex sentences. However, to strip his fictions of these and create something more straightforward would be to rob his writing of much of its power and give the reader something unsatisfying and altogether more pedestrian. I don’t believe that this is necessarily the acme of Ligotti’s work; however it is worth remembering that a writer of his ability producing work that isn’t to his highest standards is still superior to that of many a lesser writer. This is as good a place to introduced to Ligotti’s work. 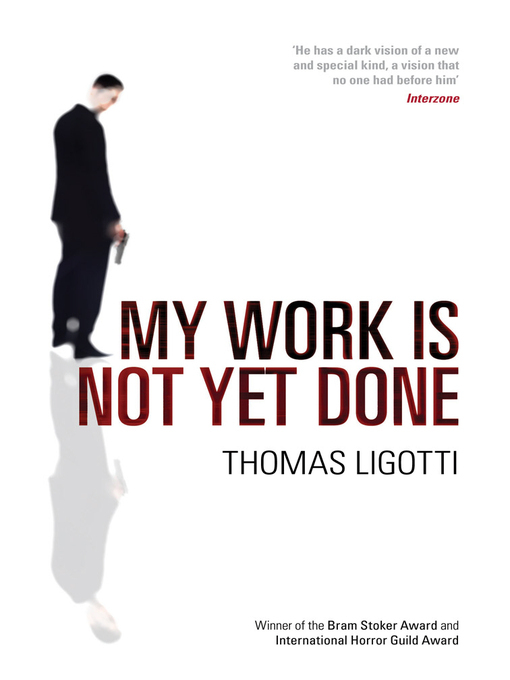 This entry was posted in Review and tagged corporate, horror, thomas ligotti, weird. Bookmark the permalink.